The second work that accompanies SEA is progressing. It is made up of contributions of drawings given to me from those I have met or been working with. In this work I am the fabricator, the pattern maker of images that collectively make one world, one textile ground. The migration of textiles and its patterns are bound into our global and local histories. It is the story of Manchester and the connecting threads to other places. Textile migrates where people cannot. The place of textile is sublunary and powerfully evocative. We all possess a version of these cloths in our homes or in our memory. They are contemporary, relevant and culturally binding. Rich heavy double-sided damask cloth from Damascus, paisley Indian shawls, Syrian flowers (especially tulips, carnations, and irises), leaves and vines, fruit, fish and birds. Suzani from the Persian سوزن Suzan which means needle, with embroidered pomeganites, sun and moon disks from Tajikistan, Uzbekistan, Kazakhstan and other Central Asian countries. The Silk Road had Trade routes from Samarkand to the west, to Persia, to the east, to China, to the south, to India, forming intersections, threads of connections and linked cultural histories made though textile. The city of Samarkand was a mix of Iranian, Indian, Mongolian and a bit of the Western and Eastern cultures. The cotton road connected the Indian subcontinent, the Americas, with Lancashire cotton clothing the world. It tests the ways of belonging within a cultural space, using textile as a medium of integration and collective expression. 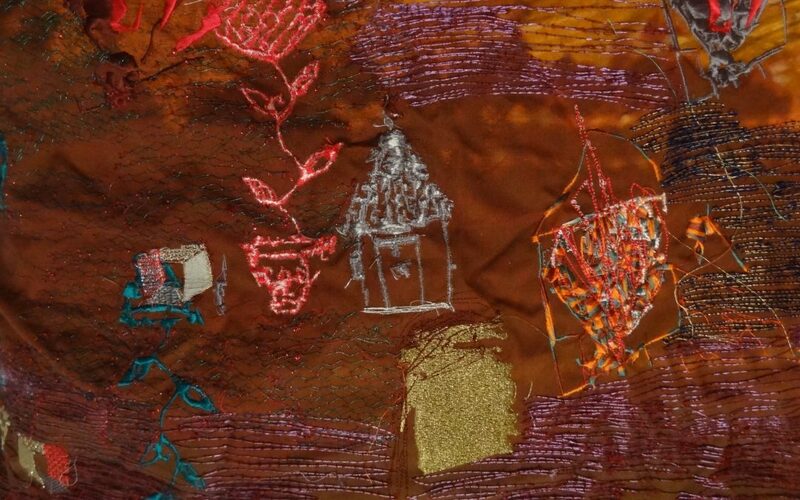 The textile works act as sites/ grounds which function as settling sites for these experiences and stories.They also acknowledge the importance of cultural heritage which is also in a transitory state. The collaborative co-creative element tests how can the refugees can tell their story, how their story can be told authentically and responsibly. The contribution of imagery is critical to this project’s notion of authentic testimony, co-creation and lived-experience. A programme of workshops with refugee groups and individuals is taking place, to collect visual imagery to contribute to the realisation of Ground and Sky. Stitching has a capacity for remaking, connecting, repairing, and joining, symbolically, metaphorically and physically. As an artist and a citizen of the world embroidery is a common connecting one world language, one that pushes for change outside of the epicentres of other battles. The hope is that the overall ‘Thread Bearing Witness’ project will in some way shift social interactions and create actual moments of change between individuals participants and beyond.